Nataliia and her husband Igor are the owners of Ukrainian Store "Slavianka" in Saskatoon. They have four children and are very active in the Ukrainian community. You will find them through their children being part of singing and dancing groups, dedicating their time to raising their wonderful kids and helping Ukrainians and non-Ukrainians alike experience the best of foods and other products from Ukraine. Meghan is the Business Unit Manager of Biotechnology at the Saskatchewan Research Council. She has a great deal of experience with strategic growth, business planning and working with non profit organizations. In addition to Stream of Hopes, Meghan is the Board member and Director of Strategic Planning and Communications for Angels & Friends Foundation. Marnie has a number of great achievements under her belt already, including being the top high school grad in 2011 for Saskatoon and receiving UCC Youth Leadership Award in 2016 amongst others. Marnie was the 2016 Saskatchewan Legislative Intern and has volunteered for a number of years for Help Us Help The Children. 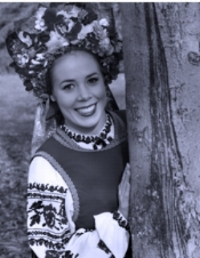 She has danced with Pavlychenko and has taught dancing for Barveenok and others. She is also a singing member of Lastiwka. Petro is the manager of a research unit within the Saskatchewan Research Council's Energy Division. He was born in a small town in the Poltava Region of Ukraine, and moved to Canada at the age of 21 to pursue a Master's degree in Petroleum Engineering. He currently lives in Regina with his wife and two young children. Petro has been involved with the Ukrainian Canadian Congress Regina Branch for a number of years and is an active member of the Ukrainian community in Regina. Bob and his wife Charmaine have organized a number of clothing drives through their connections in Martensville and are always willing to offer a helping hand. Bob is the Manager at PetSmart in Saskatoon and is involved a lot with other charitable and volunteering work with local animal shelters. Bob is also an avid Star Wars fan with a number of one-of-a-kind memorabilia which he is very proud of. Olesya and Rostyk are the co-founders of Stream of Hopes and this organization and all of the people involved have quickly become a part of their lives. To learn more about them, you can read the "Who we are" section of this website. Nadia lives in Toronto and is our board member located outside of Saskatchewan helping the organization link and develop new projects and efforts in Toronto and surrounding area. Nadia has a Master's Degree from the University of Toronto in Ukrainian Literature. She is the member of the League of Ukrainian Canadian Women, a Foundation Administrator for the Petro Jacyk Education Foundation, and member of Board of Directors for St. Vladimir Institute. Nadia likes skiing, embroidery, travelling and choral music.